This matchup could have been a bit uneven. 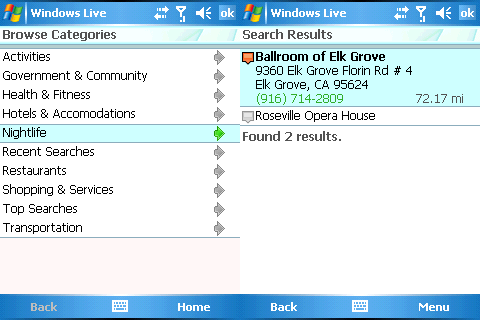 We were running WLS on a Windows Mobile phone, seeing as the Windows Live Search had a "native-app" feel, because it was a native app. 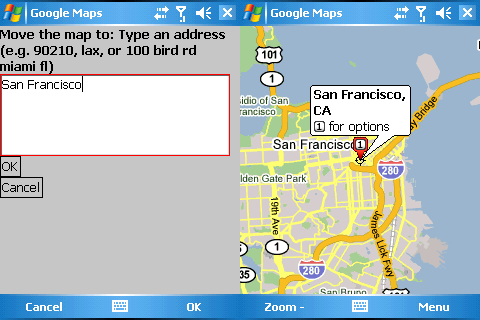 Google Maps on Java ran like Java always does. Painfully. 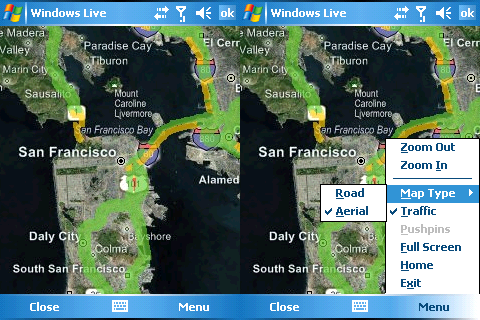 In terms of maps, both apps gave you streets as well as "aerial" view, which is a satellite combined with street names. However, WLS's looked smoother, scrolled faster, and zoomed in and out much better. Google's (above) was, well, sluggish. Traffic was nicely painted green, red, or yellow, and looked clear even on aerial view. You're going to want to use regular map view unless you really like trying to find your own house. 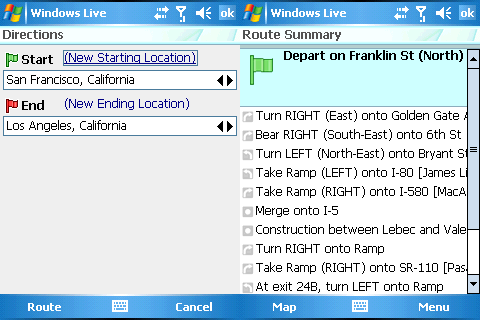 A nice touch with WLS was the turn by turn driving directions, which are usable if you're a passenger, but probably tricky to finagle if you're the driver. Google Maps also has driving directions, but on the whole, the buggy Java implementation renders it too iffy to use while driving. Local Business Search in WLS also provided interesting results, with two hits when we searched for ballroom dancing in SF. Google does have a Find Business option, but would just hang the app half the time. When it did come with a ballroom dancing result, the results were presented one at a time instead of on a list, which then in turn would sometimes hang the app. Every time it hangs, a full reboot is in order. We blame Java. 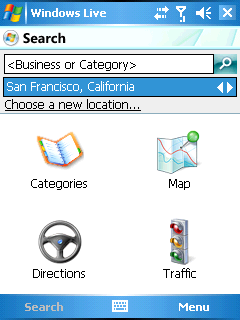 If you're using a Windows Mobile phone, we'd definitely recommend you try out Windows Live Search. The Java-based Google Maps is just too buggy and slow, not to mention clunky, to be useful to us. Update: Google Maps does have local business and directions. We updated the comparison to reflect that. Thanks to rg and insomnic for pointing out our oversight.